This is a course that has real relevance in our modern world. The course will give students an in-depth understanding of how computer technology works and a look at what goes on “behind the scenes”. 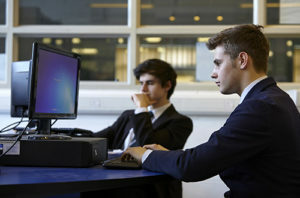 As part of this, they will investigate computer programming which, although challenging, many students find fascinating and very rewarding when they succeed in making their programs work. Through this study of computer programming, the course will help students develop critical thinking, analysis and problem-solving skills. These skills can be transferred to other subjects and applied in day-to-day life. In this unit, students learn all about what is in the box and how it all works together. This includes computer hardware such as the CPU, memory, input/output and storage devices. Additionally the unit covers software, including operating systems, utilities, representation of data, and databases. Networking and the Internet and programming is also covered. Computing is a practical subject and students will learn to program through a variety of practical activities. 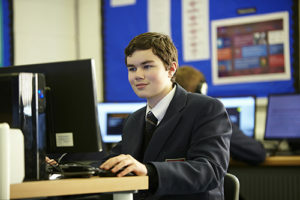 In this unit, students carry out a practical investigation into a computing issue which extends the work beyond the topics in unit 1 in order to provide a stimulating experience. Topics covered will engage the students with computing in the real world. They will work with a range of digital tools and learn to reflect critically on their own and others’ use of IT and to adopt safe, secure and responsible practice. In this unit, students will design, create, test and evaluate a coded solution to a problem. This allows them to demonstrate the practical ability to use the skills covered in unit 1. This unit is assessed through a 1 hour 30 minute examination paper worth 40% of the total marks. This unit is assessed through controlled coursework worth 30% of the total marks. There is currently a major shortage of people with the right skills in computing and companies are struggling to appoint suitably qualified people. The problem is so severe that the Department for Education has made computing a compulsory subject for all schools starting in September 2014. This course will put you years ahead of the rest. It is also an ideal stepping stone for study at A-level and degree level as well as preparation for areas which rely on problem-solving skills, especially where they are applied to technical problems. These areas include engineering, financial and resource management, science and medicine.